Advertising is evolving every day with its trends and techniques. Marketing and branding being important aspects of any business everyone wants to reach their audience in the best possible way. Apart from online marketing, businesses prefer to go for auto brands. Auto brands or auto advertising is a type of transit advertising where the brands place their ads on auto rickshaws for a better reach and visibility. Advertising on auto is not as cluttered as hoardings and flexes do. Auto rickshaw advertising in Mumbai has been evolving since 5 years according to a study by TOI. A lot of major organizations have chosen this as a medium of communication for their brands. Auto rickshaw is one of the most used transport options in cities like Mumbai and auto rickshaw advertising in Mumbai is becoming increasingly popular. Be it any business from local to big scale auto rickshaw branding helps to reach a wide audience and make people aware of the services and products you are offering. Let’s have a look at the benefits of advertising on an Auto Rickshaw. 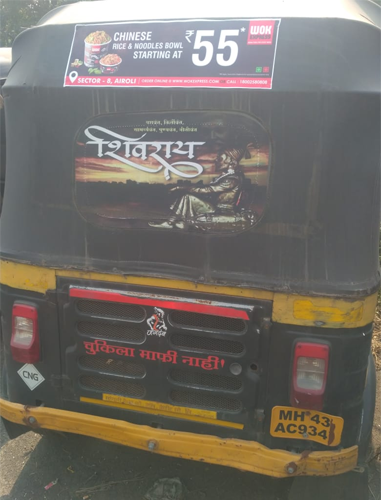 Auto rickshaw branding is a win-win situation for the brand as well the auto driver because he receives a commission for the ad being placed on his auto. Cost Effective- Auto rickshaw advertising in Mumbai is quite cost-effective as compared to other forms of advertising. It gives a maximized ROI, reaching a larger audience at a time. Impactful- With more and more businesses opting for auto brands it is also becoming creative and impactful in its nature. Advertisements and banners on autos are backed with led lights to make them stand out and giving the needed impact to attract attention. catches the attention of the people. the while we are in the traffic. This makes the brand’s message reach us in a better way. These are the reasons why rickshaw advertising in Mumbai is becoming a trend. We at Universal mediaa give our clients the best to satisfy their needs. We also try to make auto brands more innovative in its way. We are a professional company with big brands as our clientele who have opted for our auto branding services. We always aim to make you reach your goals with the mode of communication you’ve chosen.